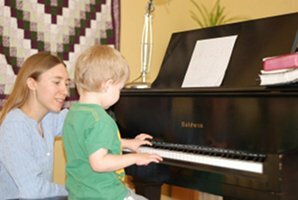 We are committed to helping each student discover the joy of making music through an individual approach to lessons, with focus on technique, theory, ear training, note reading, and performing skills. Our studio offers private instruction in piano with emphasis on the classical repertoire. Regular studio recitals give plenty of performance opportunities in a supportive environment. Lessons are available for ages 4 through adult, absolute beginner through advanced. Give us a call (907-575-1717 cell/text, 907-245-0522 home) or email (freyapiano@gmail.com) to set up an interview. We'll meet, talk, play some music, and ensure we'll work well together. From there, we can schedule lesson times. Freya's schedule is currently full, but sometimes space opens up unexpectedly. To get on her waiting list, contact us today to set up an informal interview. James is not currently accepting new cello students, but is happy to suggest other local teachers. Commitment — Lessons are scheduled by the semester. Students are required to attend and pay for weekly lessons for the full semester. Time — Students are expected to regularly practice their assigned material. The amount of needed practice time depends on how advanced the student is. Consistent daily practice is the best way to improve. An instrument — Piano students must have daily access to an acoustic piano or a good touch-sensitive electric keyboard. Homework — Students are required to read their lesson notebooks at each practice session to review all instructions and reminders. Please make sure your child is safely inside the house before you drive away. Please be prompt in picking up your children from their lessons. Parents and siblings are welcome to sit quietly in the studio or wait in the dining room during lessons. Parents are required to read invoices and any notes sent home with their children and to check lesson notebooks each week for reminders. Our complete teaching policy sheet is available for download here.